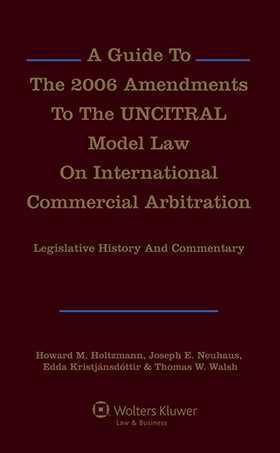 The Model Law, a major accomplishment in the field of international commercial arbitration, was prepared by the UN Commission on International Trade Law and is recommended by the UN General Assembly for use by governments throughout the world. The book contains separate sections for each of the thirty-six articles of the Model Law.After a commentary, each section contains the complete legislative history of the particular article. Arranged and edited for quick reference, this includes drafts, reports, summary records of debates, government comments and conference room papers. The book is designed to help practitioners and legislators wishing to evaluate and improve their country's arbitration law, and for lawyers and courts, in jurisdictions where all or part of it is enacted, and who are called upon to interpret the Model law. Foreword by Carl-August Fleischauer, the Legal Counsel and the Under-Secretary-General of the United Nations.